When you combine Action with Drama, you had better have a damn good story to go along with the tremendous fight scenes and wild chases, or else you get a film that falls flat. We all know that at this point, Jason Statham is the best Action star you could have, but the jury was out on how effect he could be in a more dramatic role. In Home Front, Statham plays a retired undercover D.E.A. agent, who has recently become a single father. He and his daughter have moved from the big city to the small town, which his late wife called home, in the hopes of building a better life. Everything was going as planned until his daughter, stood up to a bully at school, and embarrassed the son of one the towns most influential families. The simple misunderstanding between children quickly escalates into an all out war, which will force Statham to use everything he learned in the D.E.A. to protect his daughter and his new home. Once again, Jason Statham was terrific in this film. It is mind boggling and seems to be impossible, but every film this man does is better than the one before it. He is on a winning streak, the likes of which I have never seen. Statham was terrific, but oddly, he's paired with an actor who doesn't have much experience playing the bad guy and it showed. James Franco plays Gator Bodine, a small time hood and drug trafficker, who goes after Statham with everything he's got, the only problem is, Bodine really isn't that bad a guy. In fact, when Franco starts cursing and playing all tough, it's almost laughable, not to mention the fact that he doesn't have a tenth of the fighting skills that Statham has. Being that this was a big budget film, Written by Sylvester Stallone (Rocky), Directed by Gary Fleder (Kiss The Girls, Runaway Jury), and starting the best action star in the game (Jason Statham), it's very peculiar that they would choose a bad guy, who is best known as a comedic actor. While the story was great, Franco simply can not match up with Statham at all. 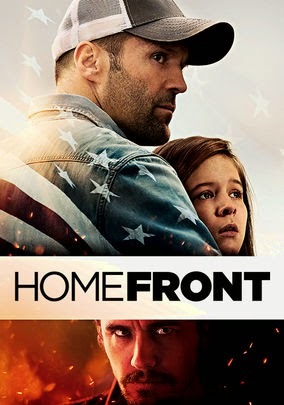 Homefront has almost everything you could want in a Thriller, but the lack of a strong, believable opponent, really calls into question just how believable the film is and makes it somewhat predictable.